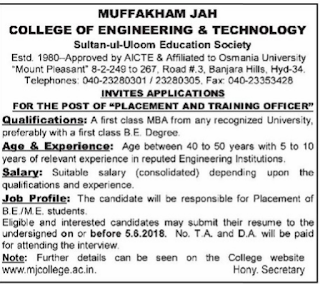 Muffakham Jah College of Engineering & Technology, Hyderabad,has advertised in THE DECCAN CHRONICLE newspaper for recruitment of placement and training officer jobs vacancies. Interested and eligible job aspirants are requested to apply on or before 5/6/2018. Check out further more details below. 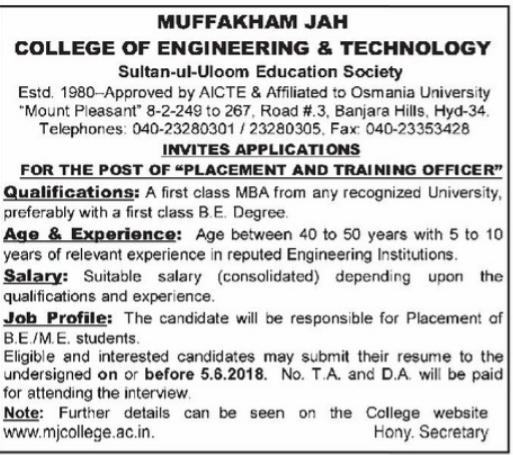 About College: Muffakham Jah College of Engineering and Technology (MJCET) was established in the year 1980 by Sultan-ul-Uloom Education Society (SUES) which is formed by a group of visionaries and intellectuals from various walks of life. Today that tiny acorn has developed into a mighty oak. Today, it is a premier institute, offering BE Courses in 8 Branches (Civil, ECE, CSE, IT, EEE, EIE, Mechanical & Production) and 5 ME Courses (CAD/CAM, Structural Engg., Digital Systems, Computers & Power Electronics) of two years duration. The current intake of all BE Courses is 780, in addition to 102 students in ME Programmes. Research Centers has started in ECE Dept & Mech. Engg. for Doctoral Studies. The college is affiliated to Osmania University, Hyderabad and approved by AICTE, New Delhi. We are applying for Re-accreditation of NBA. As per the survey of Out-Look Magazine, MJCET was ranked 62nd among top 100 Engineering colleges of both Govt. and Private colleges in India. The Week Magazine has ranked our college 56th among Top 100 Pvt. Engg. colleges in India. MJCET is among the Top 5 Engg. colleges in Hyderabad and also tops the list among Minority Engg. Colleges in the State of Telangana. A First class MBA from any recognised university, Preferably with a first class B.E degree. The candidate will be responsible for placement of B.E/M.E Students. Suitable salary depending upon the qualification and experience. How to Apply: Interested and Eligible candidates may submit their resume to the undersigned on or before 5.6.2018. No TA DA will be paid for attending the interview.